The nation is in the grip of a terrible pandemic. The so-called Empty Man disease causes insanity and violence. Government quarantines are mandatory. One of the afflicted is Melissa Kerry, and the next step should be to quarantine her – but those who enter quarantine are never seen again. Melissa's family won't let that happen. All they have to do is care for her, keep her worsening condition a secret – and they'll do anything, trust anyone, to keep her safe. 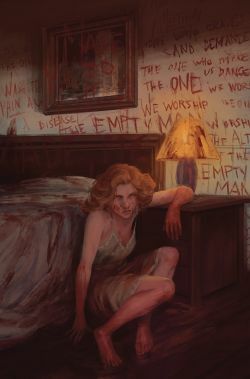 Horror writer Cullen Bunn (Harrow County, Bone Parish) returns to the world of Empty Man with artist Jesús Hervás (Lucas Stand, Clive Barker's Hellraiser) in this new ongoing series from BOOM! Studios. DF caught up with the scribe and put these questions to him. Dynamic Forces: So, Cullen, why the return of The Empty Man? Cullen Bunn: I’ve always planned on returning to this story when the time was right. Since the original series ended, I’ve been kicking around ideas for where the next series would go. Now seemed like a great time to unleash a little more surreality into the world. DF: For the uninitiated (and you know who you are), can you give us a summation of the original run of this comic and where readers will find the world we are returning to in November? Cullen Bunn: The Empty Man is the story of a contagious insanity that is sweeping across the world. Some people have started to view this disease as a kind of deity, and weird religious orders and cults have started popping up. When the new series launches, the fervor and fear surrounding this disease has reached maddening proportions. The government has started enacting curfews and quarantines. Tests are administered in public schools to alert authorities to early symptoms. And the disciples of the Empty Man have grown more and more vocal. DF: What is the overall story of this new ongoing? Cullen Bunn: This story focuses on a family that is struggling with the heartbreaking impact of the Empty Man. As they try to find a way to cope with the horrors of this disease, they are approached by a number of people. One group is a cult dedicated to the service of the Empty Man. The other is a pair of federal agents who want to find a way to stop the spread of the disease. DF: Can you introduce us to your protagonists this time around, familiar faces and new? Cullen Bunn: First up, we have the Kerry family. They are a typical suburban family, but the mother, Melissa, has fallen victim to the Empty Man. Her husband, Andrew, and her daughter, Vicki, are trying to cope with the disease on their own. They worry that if the government finds out about Melissa’s condition, they will take her away. And speaking of the government, we have agents Monica Jensen and Owen Marsh, who we met in the previous series. Here, they are continuing their investigations, but Jensen has a few new secrets of her own and a new goal—to find her partner, Langford, who vanished at the end of the last series. DF: As we’ve talked about many times, the horror genre has always seemed to be one of your favorites. Talk about this as it applies to the terror in this new Empty Man mag. Cullen Bunn: The Empty Man is mind-twisting horror. It’s surreal and cosmic and ghastly. It’s a different flavor of horror than you might get in, say, Bone Parish. It may have more in common with The Unsound, another horror book I did with BOOM. The Unsound, though, took place mostly in a kind of fantasy world. This story takes place in our world. Damn… now I want to do The Unsound vs. The Empty Man! DF: Sidebar: Can you offer readers any news at all on the Empty Man feature film in production at 20th Century Fox? Cullen Bunn: Nothing I can talk about right now, but there should be some exciting news in the near future. DF: Talk a little about the art of Jesús Hervás. Cullen Bunn: The first series was illustrated by the amazing Vanessa Del Rey. She helped to set a tone and mood that was perfect for the surreal world of The Empty Man. For this series, we needed someone who could both capture the strangeness of the original series but also create something completely new. DF: Cullen, what other projects can you tell readers about? Cullen Bunn: As always, I’m working on a bunch of new work right now. From BOOM! Studios, we have Bone Parish, which is a horror/crime fusion that has gotten a really strong reaction from readers. I’m also doing Regression and Cold Spots, both horror tales, with Image. And I’ve got a handful of other projects I’m cooking up that I can’t talk about just yet. Dynamic Forces would like to thank Cullen Bunn for taking time out of his busy schedule to answer our questions. The Empty Man #1 from BOOM! Studios hits stores Nov. 7th! DEADPOOL BACK IN BLACK #1 RARE FIRST PRINTING CGC GRADED!